I recently took a wander among the aisles and stalls of a couple of excellent food and health trade shows — Natural and Organic Products Europe, held annually at the Excel Centre, East London, and the Farm Shop & Deli Show, also held every year at the NEC, Birmingham. Here are just a small selection of the most noteworthy free from products I came across at both, starting at NOPE. A perennial personal favourite, the Free From Italy team bring the best of allergy friendly, vegan and/or gluten-free products to the UK, including Le Conserve Della Nonna sauces, Benessere gnocchi, and Taste Italia wraps. The upcoming latest addition to their stable are these ambient Gustamente gluten-free pasta parcels — Cappelletti (meat filled), Ravioli (spinach and ricotta) and Tortellini (pork and cheese). They’re not yet on the Free From Italy site, but you can read more about them on the Gustamente website … ‘shelf stable stuffed pasta’ being a perfectly splendid translation. As might be expected, there were a number of dairy free cheese alternatives, but if I were to pick one brand that stood out from the pack it would be the wide range of flavoursome products from Happy Cashew, from whose stand it was difficult to tear oneself away. They offer cream cheese alternatives, yoghurt alternatives and even buttermilk drink alternatives, but it was the round cheese wheels — which come in a dozen flavours — that were pulling in the crowds. Flavours include smoked paprika, blue fenugreek, herbs de provence, blueberry thyme, and spirulina chilli, and all those I tasted were excellent. Tough to find outside London, but maybe try vegan and organic whole food stores and branches of Planet Organic or Fresh & Wild. There’s a store locator here which you might find useful. It’s hard to separate these products as they are so obviously similar. I had no idea sunflower mince even existed as an alternative to soya mince … and then I stumbled across two, both of which organic, at NOPE. The first is by Just Whole Foods, who also do vegan fruit jellies and other products. It’s stocked by Planet Organic. The second is by German brand Sunflower Family, and I’ve only so far been able to track down on Amazon UK. Both are free of all 14 allergens. I was kindly gifted a box by each brand and shall Instagram the cooking results to my tens of devoted followers in due course. These are a range of dressings, ‘mayonnaises’, and condiments which are free from all allergens except (in some products) sulphites and mustard. Particularly useful I think is the Horseradish Sauce, as most of the non-100% horseradish products contain milk. There’s also Tartare, Hollandaise, and others, and a set of five flavoured mayonnaise alternatives which are coming soon, along with some dressings (eg ‘Blue Cheese’, ‘Honey & Mustard’). Finding vegan mayonnaise alternative these days is a bit like finding hay in a haystack, but this one — Simply Mayo — by a small brand I’d not come across before deserves a shout out because it was easily one of the nicest I’ve tasted — good smooth texture, nice tang, very convincingly like the egg-containing original. Allergens are mustard and soya. Not yet launched, but coming very soon. The brand hand-makes in small batches and as the name suggests, there are conventional pickles and relishes available too. This was one of those truly accidental free from finds that reminds you how many more there may be out there that we don’t know about, simply because the brands don’t shout about it that much. I asked on the off-chance whether there were any allergy-friendly qualities to this range of chocolate bars I’d not seen before and it turned out that they were indeed made in a no-nut factory. The team who produce them, from Salcombe Dairy (who also make ice creams which I believe are also nut-free), even go so far as drying their own mango — for their 63% Dark Chocolate Mango — because apparently it’s so difficult to obtain from a guaranteed nut-free source. You can browse and order online at their own site. These are an Australian brand of both gluten-free and non-gluten-free crisps and crackers, the former not yet available in the UK, but coming, I was told by Cotswold Fayre, who distribute them here, in around September. They were tasty and, given that they’re Australian, subject I suppose to far stricter GF standards than in the UK. “No gluten”, I presume, refers to ‘no detectable gluten’, but it didn’t occur to me to ask whether there would be UK-specific packaging come autumn, as ‘no gluten’ is not a permitted claim under EU law. 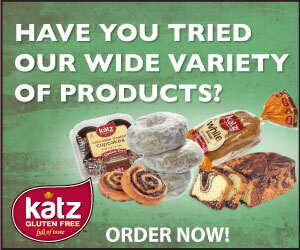 The only place I can find more information about them online is on this Australian Gluten Free Eating Directory. And finally, if only due to guilt, I’ll give a little shout to this … I get the impression that I should be a bit embarrassed at not knowing that this flavoursome sauce — known as Hendo’s in its native Sheffield and environs — actually existed, but exist it does, and from a free from perspective, offers an ideal fish-free / vegan — and barley free — alternative to Worcestershire Sauce. It’s free from all top 14 allergens, in fact. Widely available in supermarkets.